If you love your dog and your family and friends……… | Relax, it's just Life! ….this could be an important post. Today was a culmination of a week of triumph and tragedy. The triumph – I survived. The tragedy – my middle son misunderstood an email I sent him and he sent me a scathing email threatening to disown me (as my older son has done already). I still am reeling a year later from that, as the only thing I can attribute that to is me “suggesting” that he lighten up on words to his children. He is an awesome father and though he does 99% of everything right – is words are abusive. I’ve been through that abuse. I was trying to help. That scenario is the only thing I can think (plus a plate that is overflowing), causing him to dump me. My middle son sent me an email saying the first was harsh; an apology of sorts. I was on his side. I have always been! I always will be for both sons…and my daughter (who by the way is one of my best friends too!). 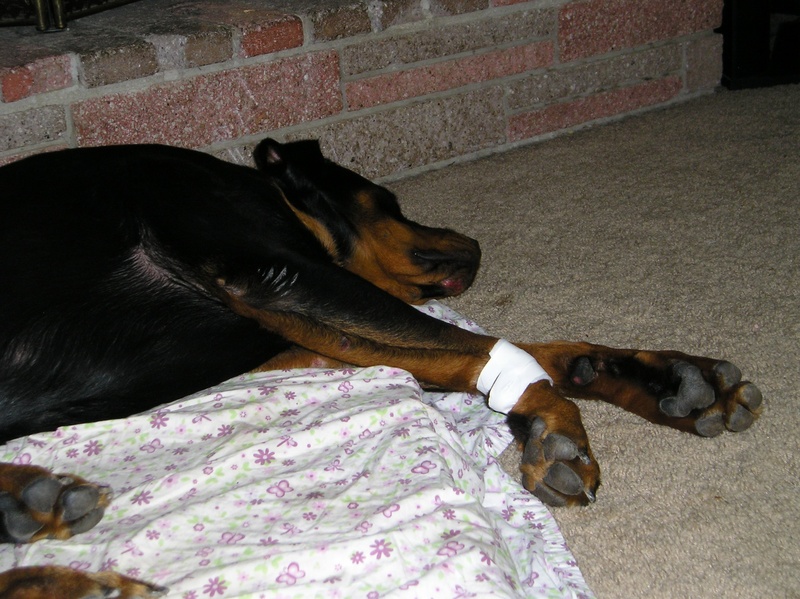 So today, after a lifetime of trauma – some self-induced, and some just “time and circumstance”, my 15 month old Rottie could have been killed, and it was my fault! I hear pros and cons of open windows in cars, being tied, being in a crate, not being in a crate. Well, I will damn well guarantee that I will NEVER get in the car again without all windows being only opened 3 inches from the top. I’ve been warned about rocks flying in and injuring my dog. Never had that happen! I’ve had dogs all my life and never had any bad things happen…they all were loved and lived long lives. I was on I-5 (major California freeway) and had to go out of town 20 miles to actually get a light crate for Dakota. She loved the air and had her face out the windows at 65-68 miles per hour. I watched her in the mirrors. Next I had to return a container to a friend who had brought me garden fresh tomatoes from her garden. I took Dakota on a brief walk at an area nearby. I fastened her in and let the windows down a bit further as it was getting hot. I was going 40 miles an hour. Suddenly I heard a big thud and quiet. I turned around to check her out, thinking she had fallen and I wanted to check her. She was gone. I screeched on the brakes went to the side of the road-jumped out of the car and saw her behind me, on the opposite side of the road – looking stunned. I thought of oncoming cars. Thankfully no cars had been there when she fell out of the car. Thankfully they were drivers who were concentrating on the road. They slowed down and we met about a hundred yards from my toyota. She wasn’t limping and she seemed okay. I came totally unglued – hugging her and thanking God she was okay. I grabbed her collar and led her to the car (and she was anxious to be there) – I lifted her and saw there was some blood. Quickly I checked her joints and body and saw nothing critical, so I quickly drove home. I brought her in the house and checked her from head to foot. There was an abrasion under the chin, one on the hip, a deeper one at the bend in the right knee (all the skin and hair gone) and one just below that. There are small various abrasions elsewhere. I called my husband (working out of town) – called my friend who is a vet assistant – and proceeded to attend to the wounds. Though she isn’t limping, she is exhausted and rather in shock. I just wrapped the one wound and have been sitting with her for two and one half hours now. I have been through worse in life – trust me – but this is now, and she is my friend and a beloved family member. She is going to be fine. Obviously she probably will be sore and still for the next few days, but I thank God it wasn’t on the freeway. What has come to mind is the importance (once again) of cherishing each moment you have. Had I been pissed off at her, or ignoring her, or too busy to play not loving on he, it could have been all over just that fast. Think about it. Equate this incident to your family and friends. LOVE LOVE LOVE while you can! Of course everything that I do or ask or receive I ask and thank God, as I know Him. I know there is a superior being as the human mind and body are superior to anything on this planet earth. We may be able to clone something, but the Spirit is given from God. THANK you God for miracles and Grace. This entry was posted on September 16, 2010 at 3:29 am and is filed under christianity, family, friends, LIFE, people, personal, random, Uncategorized. You can follow any responses to this entry through the RSS 2.0 feed. You can leave a response, or trackback from your own site.